The Traditional Naturopath on-line course is for students who have the desire to explore the body, emotions, and mind as they experience a variety of therapies and treatments on a personal level, and at times, help others, such as their classmates, families and future clients to experience the same. Naturopathy is a holistic system combining philosophy, principles, and practice that uses a variety of natural therapies to support healing and maintain good health. Its guiding principle is “to do no harm” using the “Healing Power” of nature. 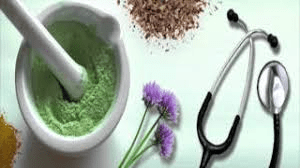 The purpose of this class is to empower and equip students with a thorough overview and all of the principles that a naturopath needs to counsel others in natural health care. If a student just wants a self-healing module, this course is a great one to complete. On the other hand, students who do all of the assignments and attend classes will receive the Traditional Naturopath designation. There are several books required for this course. Contact Betty Sue because this changes over time. A course in Anatomy and Physiology is required to receive the Traditional Naturopath designation. If you do not take A&P then you will receive a certificate of attendance. This is an online course taught by Betty Sue O'Brian MD. You can start this online course now. Today’s toxic air, water and food requires that each person take care of his or her health; the food and chemical industries have, over the last 100 years, altered, affected and damaged the lives of millions of all of us by introducing synthetic chemicals into our food and water. This class prepares students with a variety of holistic modalities from very diverse viewpoints to help them take charge of their own health and to begin to provide others with health advice. Students will explore making poultices, clay baths, foot baths, aromatherapy, light therapy, and other natural health modalities and therapies. Included in the course is an introduction to iridology, herbalism, energy medicine, flower essences and Eastern medicine. Each of these topics is a study in itself, but students may decide whether to pursue these as separate modalities to add to their tool box once they begin their career as a Naturopath or Holistic Health Coach. This class may be taken for personal growth and healing whether or not one chooses to pursue a career in naturopathy. As students progress through the year-long class, they will find themselves restoring harmony to themselves and connecting with others as they evolve into a more natural way of living. This process alone will help them to evolve into their greatest potential. As they release old ways and gain confidence with different modalities, they will shift into a life-long quest for health – for themselves and for others. Students will prepare case studies in the class, as they begin to nurture others along their path; this process will help them to gather their tool box for a variety of health conditions. Students gain practical life skills, experience proven cleanses and dietary regimes, and discover how to make healing foods and drinks that are delicious and nutritious. In a 21st century of fast food, Franken foods, corporate greed, and GMO and poisoned crops, along with excessive eating, over indulgence and mass ignorance , our graduates will be properly informed with the wisdom of the ages and the latest research in natural healing today. While each class covers a body system to help to clarify the teachings, a separate class in Anatomy and Physiology is required, from the Southern Institute of Natural Health (SINH). Click here to learn about Anatomy and Physiology. Class Seven - Iridology, Sclerology and Rayid. Are you interested in this topic, but not ready to commit to this course? ...then buy Betty Sue's book Six Weeks to a Healthy Lifestyle. 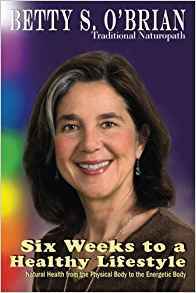 This no-nonsense book empowers its reader to accomplish in six weeks what they haven’t been able to do in a lifetime. It is a manual for living healthy in a not-so-healthy world. This step by step manual takes the reader through it all gently and successfully. Whether your goal is to raise a healthy family or to lose weight and feel great, this book is for you. 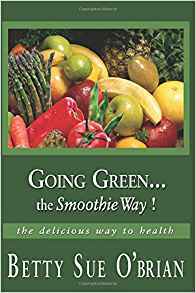 Too many smoothie books recommend fruit filled smoothies that feed cancer, viruses and fungus! This smoothie book is unlike any other; in this book, the smoothies are categorized by body system. Betty Sue offers smoothies that help with specific issues e.g. cancer, elimination, respiratory issues. There are also recipes that will appeal to children.